After busy weekdays at office, weekends have become luxury. After late night movies, parties and snacking most of the times we end up having brunch or lunch. At times on weekends there are moments where we don’t want to spend lots of time sweating in kitchen with elaborate meal menu and at the same time, not compromise on eating something special. By well planning and with little touch of creativity (and sometimes craziness) my hubby dear and I spend less than fifteen to twenty minutes in kitchen preparing food. For days like these dosa, idli batter come very handy which could be prepared well in advance and stored in fridge for days together. Soak rice, urad dal and moong dal in water for atleast 4 hours and rinse. First grind coconut, coriander seeds, jeera, jaggary, tamarind pulp, red chillies to smooth paste and keep aside. Next grind rice, urad dal and moong dal with water to coarse paste. The consistency and texture of the batter should be as that of idli batter. Mix in both the paste and keep it aside. Wash colacasia or collard green and pat them dry with kitchen towel. Remove the thick veins of the green with small sharp knife or peeler. Lightly crush these veins with pestle so that rolling becomes easy. If the leaves are quite tender then no need to remove the veins. Now pick the largest leaf and place it upside down, meaning the side where you have removed the veins is facing you. Apply thin coat of ground masala all over the leaf and place another leaf on top of it. Repeat the same procedure by placing 7-8 layers of leaves. First fold both the edges along the length and then start rolling, tucking the sides in between till you reach the end of leaf. When rolled, it will look like swiss-rolls. Place these rolls in a steamer and cook for 20-30 minutes on a medium flame. Once cooked, leave it in steamer for at least 15 minutes before serving them. Once it is slightly cooled down, take a sharp knife and slice them into ½ inch slices. Serve them with a tsp of coconut oil poured on top and a piece of Jaggery. Adding urad dal and moong dal reduces the heat produced by chillies and colacasia leaves. Tamarind is added to reduce the itchiness of colacasia leaves. So increase the amount of tamarind if the leaves are quite mature. Heat tawa/griddle and spread a tbsp of oil on it. 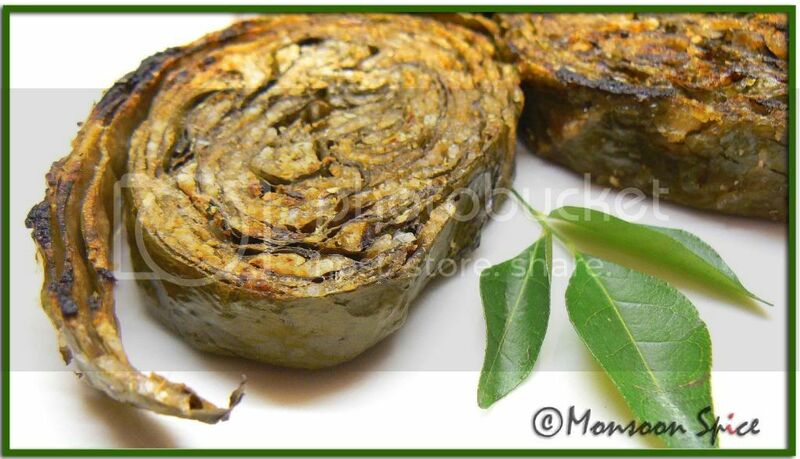 Place Patrode slices on tawa and fry till the sides turn crisp and golden brown. Serve hot with Jagger or Coconut Chutney or Tender Mango Pickle or eat as it is. Patrode Uppukari is usually made with left-over patrode. This is what we usually cook for weekend brunch when we don’t want to spend more time in front of gas yet crave for something special and home made. It hardly takes more than 10 minutes to cook from frozen Patrode. Heat oil in a pan and add urad dal, dry chillies, mustard seeds, hing and curry leaves. When mustard starts to pop and sputter, add chopped Patrode pieces and Jaggary. Keep mixing the mixture till the pieces are just heated. Switch off the gas and mix in grated coconut and mix well and serve hot. Patrode in Jeera-Coconut Bendhi is another delicacy from my Ajji’s kitchen. 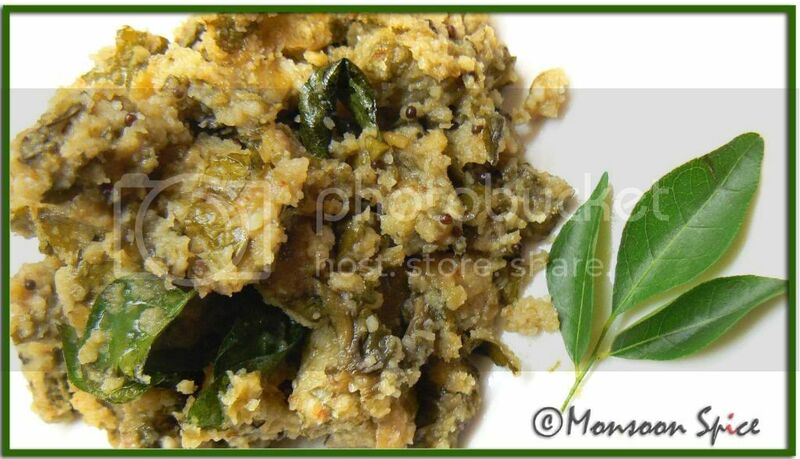 The spicy Patrode is cooked in sweet coconut chutney/bendhi is a marriage made in heaven. Grind coconut and jeera with little oil to smooth paste of chutney consistency. When mustard starts to pop and sputter, add ground coconut-jeera and jaggery and bring it to gentle boil for about 5 minutes. Now add Patrode pieces and mix well coating all the pieces with Coconut-Jeera Bendhi and stir fry it for 2-3 minutes and serve hot. OMG Sia, first of all what a lovely blog, looks very nice and also seems like a nice place to hang out.I am drooling all over the partode pic, I pretty much have all your recipes bookmarked and this is no different. New look is gorgeous, Sia! Patrode are yummy in any which wy you prepare them :). Quite a slurp worthy post, dear! love the font in the header. is it jokerman? patrode with jaggery is new to me, but sounds like something i'd love to try. This is metamorphism!! From all those traditional artistic look to a modern look? Extreme makeover! Same pinch on Pathrode. I just made them last week and got few more to make another dish, just finished publishing now. Jeera coconut bendhi is something I have to try soon. Love your new space Sia. All the best! The Pathrode looks awesome... as always lovely pics. Hi sia, i never made patrode but is sounding good and looking delicious.And that 3 ways of patrode nice. Ur new place is also looking good has it's own uniqueness. Nice! Total comfort food for me where we call in alloo chi wadi in Marathi :). I didn't know of the 3rd kind though. Sounds yummm! I have not tasted this dish..looks very delicious. Something to try. Yummy... I have my other half roll in the freezer... I think I am going to have that very soon. 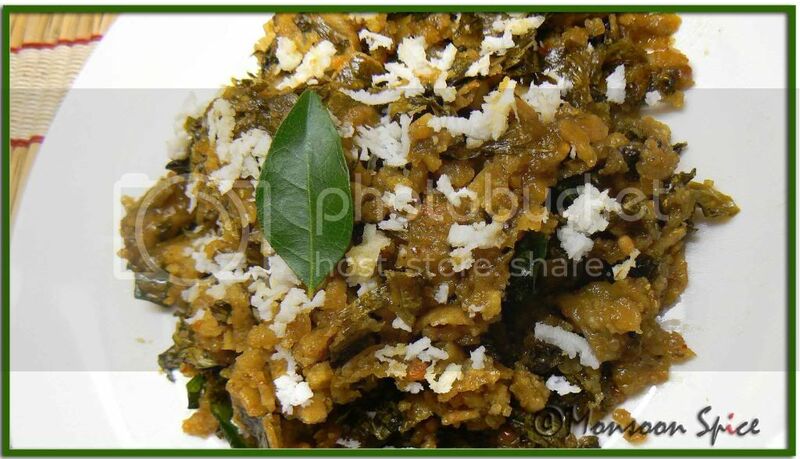 i have tasted this in a konkani house back home in kerala. remember loving it! Wowee that sounds so wondeful and tasty. New home looks inviting and beautiful. Love u'r unique concept, love the template, love that pale green!! Looks great,I have never eaten Pathrode at all. Have a great week Sups. Wow i have never heard about this dish. Holy beautifulness!!! Absolutely. Fabulous. Love patrode and this is the mother lode! Super Patrode!! these are also called aLu Wadi! Wish I could get the leaves here, keep an eye open for 'em!! wow..love the new look. Patrode is a totally new dish to me. Good picture. Have to read through your post in the evening. aha, I love this dish, One of friend planted taro root in her backyard and she made this for gowri ganesh puja. I went to her place for dinner and this was deliciousssssssssssssssss:). hey Sia, your blog rocks! it looks so creative and lovely. delicious looking patrode too. good move on the blog anniversary. I think you gave me an idea. love your look and You have a lovely blog.the recipes awsome.thanks. I love your new website! Nice ideas for patrode - we call the arvi ja bhajia. the Leaf is called arvi ja pan. Nice Nice Nice Supriya...Congrats on your new domain girl. Looks fabulously gorgeous. Love this new cool contemporary look. I am a big fan of pathrade as well and the pictures look great. Congratulations on completing a wonderful year of postings and for your new website. Like the new look of your website. Miss those tiny 'chakras' of your blog. Let me sit relaxedly and go through your posts. Pics look lovely. hey sia, such a cute header, liked the new look a lot! It has been ages since I pathrode. My friend, our beloved Ki, used to bring it for lunch and we would end up eating it. I think it is high time I learn to make it and make for her for a change. Love the new header and the look and feel of the entire blog - whimsical, playful and inviting. I wish I could taste some of that patrode. Hi Sia, wow the new look is awesome. Patrode rocks! The new layout looks cool indeed...all the recipes, new to me, do look and sound great. Your new blog looks nice, how's the experience? LOL... yup, i wanted something very modern for my new blog:) after 2 days of playing with codes and colour scheme i settled for this. i have heard of alo chi wadi but not sure of the ingredients used to make it. 3rd kind will be found only in mangalore dhana. i did get ur mail jyo but was too busy to reply bk. will mail u shortly. sorry for that. it might look quite complicated when u read the instructions but its really easy dish and dont take much time. u prepare the batter in a same way u make it for dosa and just spread them in layers on colacasia leaves and then roll them. thats all... :) try it HC as i am sure u will like the taste of patras. u r lucky to have a friend who cooks this for u. but there is a difference between mangalorean n gujarathi patra in the ingredients used. i am sure u will find the leaves. u will get them during aug-oct months in indian stores. just keep an eye..
thats so sweet of ur friend:) do post her recipe when u try it. ur wish is my command lady:) i have made changes and moved the content bit little up. let me know what u think of it now. thanks tee. collad greens are little thicker than colacasia leaves but i love both of them. infact my grandmom prefered collard greens to colacasia. taste wise i really cant make much difference. try them and see. gd to see u after long time:) hw have u been? hope u did get my mail and scraps. a warm welcome to my corner. thanks sweetie:) r u back from ur india trip??? Where can we get colocasia leaves Sia? Is it common in US? Btw, when I come to your blog, I see that all the posts are down. I mean I have to scroll down. For the past two times I did not know that the post was down. I thought that there was some problem and left. I'm not sure if I'm the only one experiencing this. Just wanted to bring it to your notice. Hi Sia, Yes I am back, still settling down with lots of work. Could not resist checking all the blogs...heheee...Will come back soon on blog with elluavre..
i live in UK kribha so i have no clue where u can find the leaves in US. i am sure u should be able to find them in any indian stores in nearby major cities. Thanks suppi for letting me know about all those recipes that have been copied from my blog. I feel so very cheated and down. I am serious...not just this blog many other blogs have copied a lot of my recipes as is. All my hard work is for this heli avthu ... I am seriously thinking of making my blog just private. Ridiculous!!! I am so very upset. Anyways thanks aatha heliddakke. u r welcome:) and hey, dont be discouraged. u know we all love ur blog rt? i have put a script which disables right click and there is no way anybody can lift my images. if u want it just let me know. i will mail it. and start making ur pictures private if u r uploading them in flickr or photobucket. will mail u soon. we r just bk from our trip to wales. Lovely blog and lovely pics of pathrode..looks good enough to grab from the screen and hog!!! Got one more variation for you. Make the paste as a batter to dip slices of a vegetable and arrange in a circular/flower pattern on a pan and fry like dosa, until the vegetables are cooked. Vegetables I have used are potatoes, eggplant, ridge gourd (peerikai) or bottle gourd (dhoodhi). I have also added chopped cabbage and put it on the pan similar to the sajjige rotti. I was googling for a recipe using the Colocasia leaves and voila, I stumbled upon your site. Love the simplicity of the filling. I am however confused over the part where you say that the thick veins should be cut out and then talk about using a pestle to smoothen it out. Do you throw away the vein or leave it in, assuming it is thick? Hoping you can give me a quick answer as I am planning on making this tomorrow the 30th! Thank you. I made this yesterday and it was a super hit. I am from Bangalore and I got hooked up on this when I accidently stepped into one of the mangalorean stores that sells condiments.I liked it so much. I tried once and it did not come properly. This time, it was a huge success. I increased the red chillies a little bit and I added half of tuvar dal and 1/2 of moong dal instead of only moong dal. @Neela, Glad u enjoyed it Neela. Patrode is my all time fav. 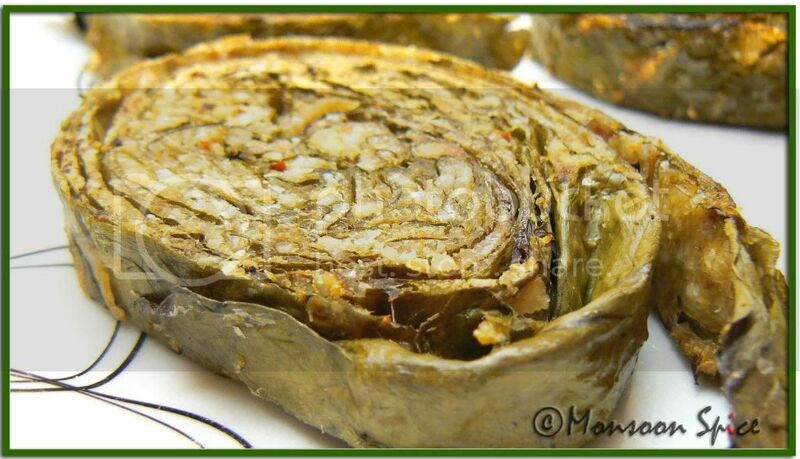 U may like patrode made with banana blossom too. 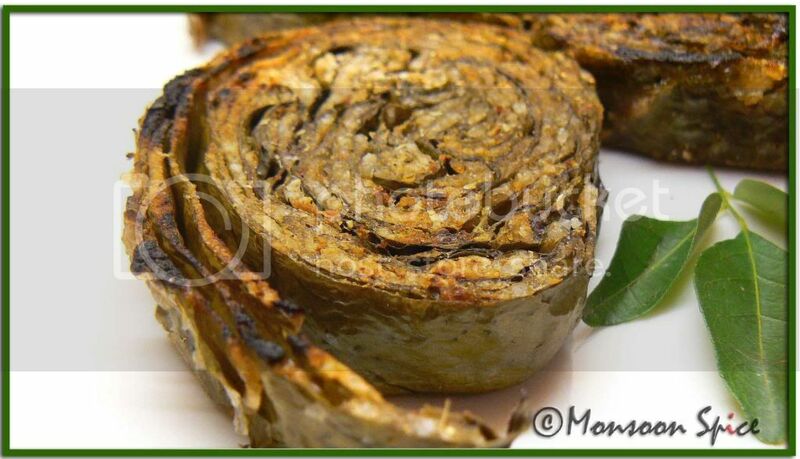 I tried this patrode with Collard leaves. The taste however was good but the collard leaves are too very thick in nature and they did not steam well. So,they were not tender enough to eat. I would prefer the collocasia leaves than the collard leaves. 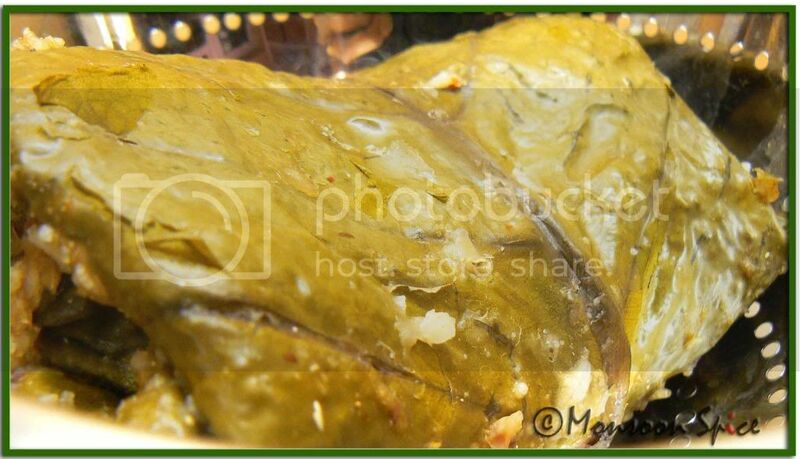 I live in canada and I do get the patra leaves here in the Indian market, but since they are quite expensive, I tried to make it with collard leaves. Will it make any difference if we blanch the leaves first before stuffing/rolling them? Is it possible that way? And, I don't see you blogging now a days.. Are you taking a break or did you stop?